Winners of the 2018 Intramural Emory Global Health Case Competition include (left to right) Audrey Copeland, Taryn McLaughlin, Wen Liu, Sarah Connolly, Kristin Nelson and Christine Donorio. The team proposed creating a center to improve refugee health in Atlanta by training community health workers and engaging university students and the broader community to interact with local refugee communities. Twelve Emory student teams tackled the health challenges of one of Atlanta’s most vulnerable populations during the Emory Global Health Institute’s 2018 Intramural Emory Global Health Case Competition. Held the first weekend of February, the global health case competition charged multidisciplinary student teams with developing strategies to improve the health and wellbeing of the city’s refugee communities. The teams acted as student consultants for the newly appointed president of the fictional Atlanta-based Henry University. Teams were given a one-year timeframe and a limited budget to develop their strategies, which they then presented to a panel of judges representing Henry University’s president. The winning team recommended that Henry University establish a center whose mission would be to improve refugee health and wellness by training community health workers and engaging Henry students and the broader Atlanta community in service learning opportunities and cultural activities with local refugee communities. Members of the winning team included Sarah Connolly, Laney Graduate School; Audrey Copeland, Nell Hodgson Woodruff School of Nursing/Rollins School of Public Health; Christine Doronio, Laney Graduate School; Wen Liu, Emory University School of Medicine; Taryn McLaughlin, Laney Graduate School; and Kristin Nelson, Rollins School of Public Health. This was the team’s second year of competing in EGHI’s intramural global health case competition. While Henry University is fictional, it served as a stand-in for Emory, and the challenges the case presented accurately reflect those faced by Atlanta’s refugee communities. “I was so excited to engage with such an apropos and important topic. The broader political issue of refugee resettlement is such an important and complicated one, but one that faces the city of Atlanta – and by extension, us – in real life,” Nelson says. Dr. Parmi Suchdev, EGHI associate director and the faculty adviser for this year’s case writing team, steered the topic direction this year because he thought having Emory students address this problem would assist the university in determining how to best engage with Atlanta’s refugee communities. Suchdev has been leading an initiative at EGHI focused on this topic for the past year. EGHI began hosting global health case competitions for Emory students in 2009. 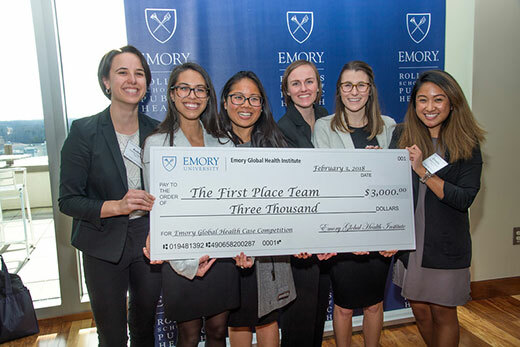 The winning team will go on to participate with 23 teams from universities based around the world in the International Emory Global Health Case Competition scheduled for March 16-17. For more information about the Emory Global Health Institute and its global health case competitions, visit www.globalhealth.emory.edu.